I’m an old retired English teacher, who’s written a lot of books, many of them under my own name, many of them not. I’ve been collecting paperback originals for many years, and I have way too many of them, not to mention too many other books as well. My kids are going to have a wonderful time at the recycling center when I’m gone. I’ve been writing for as long as I can remember. Some kids like to do math problems, some like to play sports, some like to write. I was one of the writers. I didn’t get serious about publication until I was nearly 40, but I’ve made up for lost time. 3. Which of your novels is your favorite? My favorite book is always the one I’ve just finished working on and sent off my agent. In this case that would the one called HALF IN LOVE WITH ARTFUL DEATH, part of the Sheriff Dan Rhodes series. My second favorite book is the one I’m going to write next or have already begun writing, which in this case would be one I’m calling BETWEEN THE LIVING AND THE DEAD, another Sheriff Rhodes epic. I suspect that will be the publication title, too. When I sit down to write, I always revise the work from the previous day. It gives me a way back into the story, and it saves me from any number of egregious typos on the final draft. Not that there aren’t plenty of them in there, anyway. I always write in the evening. That’s because when I was teaching, the evening was the only time available. So I got into the habit, and I can’t seem to break it. I almost always have Dr. Pepper by my side in some form or other. I tried to quit drinking it when the parent company give the old scroogie to the Dublin plant, but I found that I couldn’t. 5. You’ve written over 35 novels. What’s your secret for staying so productive? Actually I’ve written about twice that many. Those are just the ones under my own name. Some of the others are things I can’t reveal and will never reveal. That’ll give the collectors fits in the future, assuming there are any collectors, which I have serious doubts about. The way to stay productive is to sit down and write every day. Have a time and a place and do the work. That’s all there is to it. That sounds easy, right? I wish it were as easy as it sounds. I started by blog the week before I retired from teaching back in 2002. It took me a while to figure out what I wanted to do with it, but it eventually settled into whatever it is now. Lots of links, plus book reviews and movie reviews, and whatever else I put in there. I look at a lot of news sites, and people even send me stuff to use. The blog is my way of entertaining myself. I find I spend too much time on it, and I need to cut back, but so far I’ve kept it going. It happened today, cosmically creating connections where there had been none. Through a partnership with drinkupcolumbus.com we decided what beer Kurt is going to drink in today’s chapter, Columbus Brewing Company’s Bodhi. Its appearance in the book fortuitously comes at a point that happens to pay offhand homage to the 1990’s hit movie Point Break. It’s like the world blessed us with its sudden oneness. It makes me feel like the Universe is on my side. The beer is absolutely delicious. Now if you’ll excuse me, I’m done with all this mystical talk. I need to do some more writing to get my balls back where they belong, instead of tucked up in my pelvis. I like unity, but I’m not trying to grow ovaries any time soon. 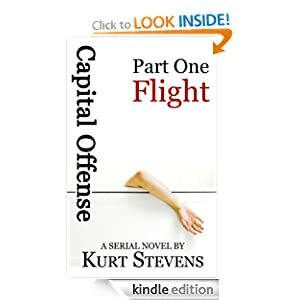 Author Drew Farnsworth labeled readers of Capital Offense “Offenders.” How do you like that? So Offenders, want more Kurt Stevens? There’s plenty more to go around! First, join us on Facebook for exclusive announcements and bonus materials. “Like” the page for alerts to new chapters and cool stuff. Second, check out Kurt’s blog at KurtStevensAuthor.com. Finally, check out Kurt’s awesome guide to dating on TwentyDollarDates.com. You’ll find five boss rules for better dating. Kurt Stevens has begun an interesting experiment, a serial novel on the ‘Net that’s also being published in eBooks of several chapters each and that will eventually be published in the traditional format. Here’s a link to the first eBook, and here’s a link to the beginning of the serial, which is pretty far advanced by now. The interview below will tell you a bit more about Stevens and about his novel. I live in Columbus with my son, Michael. And I guess art really does imitate life, because both of those facts found their way into the novel. I like to spend my mornings working out and clearing my mind to write. Then I put in some hard hours, and reward myself with a beer. Life is good. I started writing in college and haven’t stopped since. I love the escapism it provides, and the release. 3. How did you come to write Capital Offense? I wanted to write a story that explored the death penalty without taking a stance on it. When the main character is an executioner, we see all the issues through his eyes. I was also inspired by reading about prisoners. Almost all of the prisoner stories mentioned in the book are based on true events. 4. Tell us a little about the plot. Kurt Stevens, the main character, (I guess I secretly want to lead a double life) comes home one night to find his beautiful wife Tonya murdered in the bathtub. As a member of law enforcement, he knows that the husband is the first person the police will suspect. Unfortunately for him, he’s the only one they suspect. So he goes into hiding, and travels all over Columbus, trying to unravel who wanted her dead, and why. But the discoveries he makes come with a price. 5. What writers would you consider your main influences? Dean Koontz, Stephen King, and Tom Clancy. I love writing suspense and continuing the pulp tradition. 6. Why publish the novel on the web in serial form before the hardcover publication? And why publish 3 e-books with parts of the novel before the full book? I want readers to be tuned in. I’m trying to build suspense so that more people will return each day to see what’s happening next with Kurt. I also want readers to tell their friends so they’ll tune in. Instead of everyone reading a book at a different pace, we’re all on the same chapter, together. And then, if they’ve been entertained, I hope that they will support my work and purchase the book. The eBooks were intended to bring in new readers and get them up to speed. My publisher and I also agree that it’s time for the publishing industry to evolve, and offering this content for free online, and putting the reader first, is a great step. The brain is an organ. It requires proper nutrition in order to function properly. That means a mixture of good carbohydrates, phytonutrients, antioxidants, proteins and fiber. To that end, I have developed a regimen of five ounces of organic kale, seven ounces of organic sunflower seed butter and 24 ounces of green tea as my morning elixir. I will sometimes mix in a whole boiled chicken breast. This meal is consumed within twenty minutes of waking. Only after this regimen am I ready to write for at least four hours straight. After the writing is completed all bets are off. I eat steak, I drink beer. Night Kurt is a different person from morning Kurt. Morning Kurt is healthy and responsible. Night Kurt is a boss. So Ohio is running out of Pentobarbital, the drug that it uses for its lethal injections. As noted in the previous post about compounding pharmacies, large manufacturers tend not to want to supply drugs for lethal injections, so Ohio must rely on its existing stock. In response to the shortage, Ohio is taking a two pronged strategy. Firstly, it is turning to compounding pharmacies. Secondly, it is changing its lethal injection protocol from using a single drug to using two drugs in conjunction. This is considered to be a backup to the existing pentobarbital method. There is no agreed upon formulation for lethal injection drugs in the US. Each state is required to create its own protocol for the process. Pentobarbital is a sedative that is believed to cause a painless, and even euphoric death. Ohio has changed its lethal injection protocol three times in the past five years. That means that the technicians who administer the lethal injection regimen must be trained again each time one of these changes takes place. The executioners, much like Kurt Stevens the character in Capital Offense, are not doctors. They may be highly trained and able individuals, but there have been mistakes made during the lethal injection process. The new regimen, a combination of hydromorphone and midazolam, has never been tried before for lethal injection. Hydromorphone is an opiate similar to morphine. It is used to relieve pain in a hospital setting. The drug generally causes a sensation of euphoria and sedation in medical patients to whom it is administered. Midozolam is a benzodiazepine, which is different from an opiate in that it is a muscle relaxant. It is not yet known how these two drugs will interact during the lethal injection procedure. There’s some controversy over the use of muscle relaxers like Midolozam in lethal injections. Since it is a muscular sedative there is a slight chance that the drug could render the recipient of the drug incapable of moving while maintaining neurological function. This is a phenomenon that has been observed in medical patients who have received certain types of sedatives, but has never been observed in lethal injection cases. This is generally the reason why a second drug is used, so that the neurological function can be sedated as effectively as the muscular function. The pharmacy from which the state of Ohio is receiving the drugs has not been disclosed by the state prison agency. Now I’m mentioning mentions of mentions. A few years ago that would have been unfathomably meta but now it’s just the fact of the Internet. The site BeerLES.com made a note of the poll on drinkupcolumbus.com which then linked back to capitaloffensebook.com. So now I’m mentioning BeerLES.com. It’s a fairly tidy circle. Drink Up Columbus is putting up a poll to see what beer Kurt should say is the best beer in the world. The requirements are that it be a Columbus beer, but apart from that the list is diverse and really interesting. I’m excited to see what this beer says about Kurt. A beer can define a man. Will he have a slightly fruity side or will he prefer the bitterest of bitters? You get to decide.